At this time of year one may ask the question: “What do the New York Zoological Society (NYZS) and Rockefeller Center have in common?” As it turns out, the Society and this long-standing New York City gathering place and holiday beacon have a historical relationship–with a festive flavor. At several times throughout the mid-to-late 20th century, the archival record shows that the Bronx Zoo has had a history of presenting animals at the landmark site. According to a Society press release from August 16, 1941, the Bronx Zoo and the New York Aquarium exhibited a troupe of fifteen penguins at Prometheus Fountain that replaced a group of sea lions which had been on exhibit the month before. Another press release, from December 1st of that year, announced the acquisition and exhibit of four “live reindeer of the ‘Santa Claus’ kind” at Rockefeller Center in a Christmas installation. Excerpt from an NYZS press release dated December 1, 1941. Scanned from WCS Archives Collection 2032. Twenty-seven years later, during the unveiling of the 36th annual Christmas tree, another wild creature made its debut at Rockefeller Plaza – albeit not by planning on the part of NYZS. According to the article, the owl, which had travelled from Canada, found an American home at the Bronx Zoo. 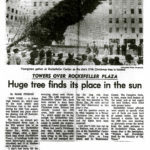 An excerpt from Mark Finston’s article, “Towers Over Rockefeller Plaza: Huge tree finds its places in the sun,” published in the Newark Star-Ledger on December 2, 1969. The text reads: “When last year’s Christmas tree was hoisted, a small owl, which had apparently been living in the tree, and which had not emerged during the long ride from Canada, let out a screech. 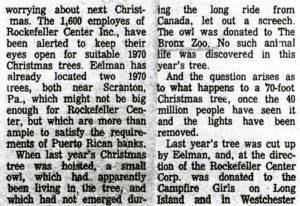 The owl was donated to the Bronx Zoo. 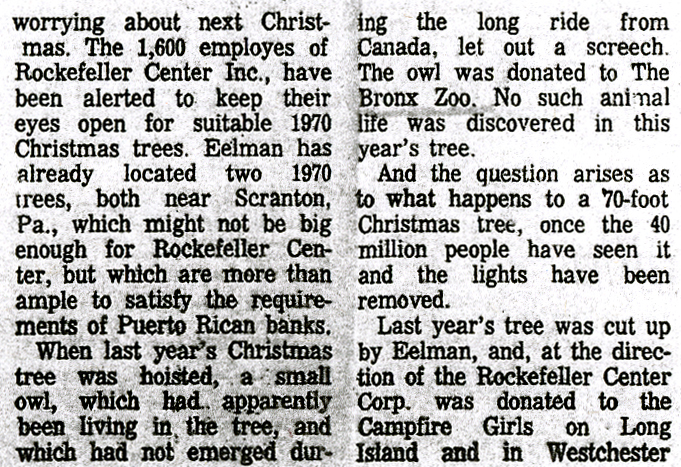 No such animal life was discovered in this year’s tree…” From a clippings file titled “Birds, 1969”. Scanned from WCS Archives Collection 2032. 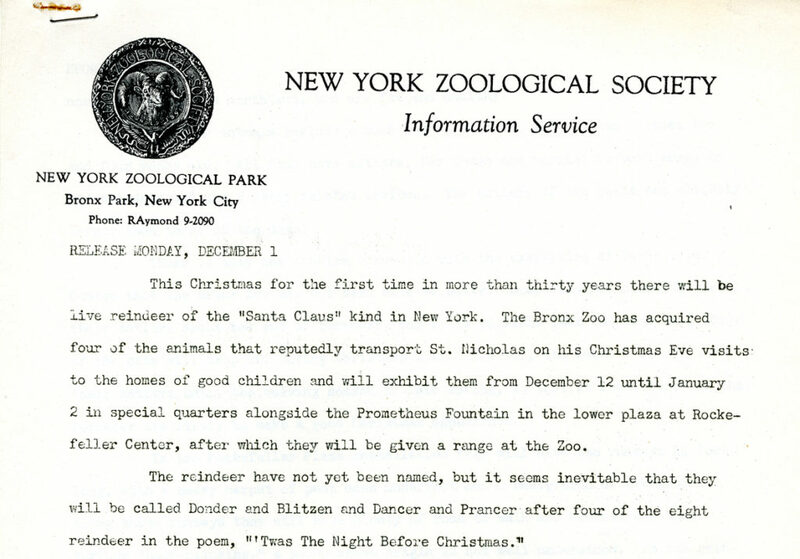 This post highlights one item from over 40 years of press coverage featuring NYZS, the Bronx Zoo, and the New York Aquarium held at WCS Archives. The bulk of the material dates from the 1940s-1980s and includes coverage in print and broadcast media from local, state, national, and international news outlets. This post was submitted by WCS’s National Historical Public Records Commission (NHPRC) Project Archivist, Emma Curtis, who joined the WCS Archives in July 2016.